In small deep microwavable bowl, place vanilla frosting. Microwave uncovered on High 15 to 20 seconds or until mixture can be stirred smooth. Stir in green food color until light green. 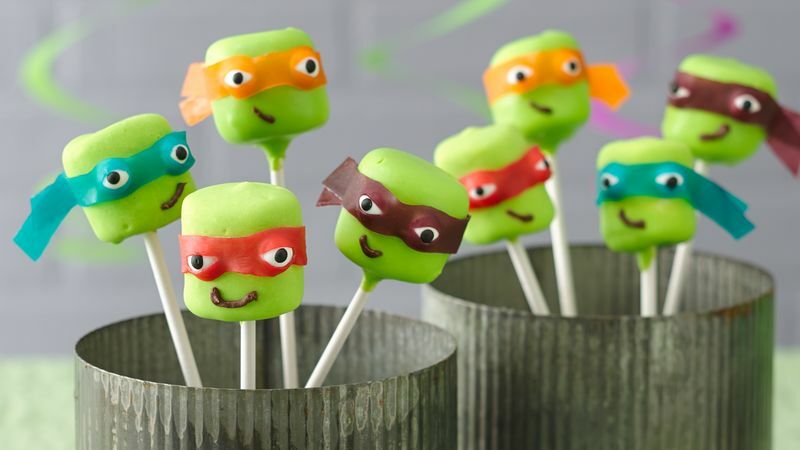 Insert 1 lollipop stick into each marshmallow; dip into frosting to evenly coat. Place in tall glass to dry. Unroll fruit snack, and cut off about an 8-inch strip of desired colors to make masks on pops. Place cut strip on cutting board. Starting at midpoint of strip, use small sharp knife to cut small horizontal slits for eyes about 3/4 inch apart. Place candy eyes under slits in fruit snacks. Place masks on dried marshmallows, tying to secure. Cut off some of the fruit snack on ends, leaving about 1 inch remaining. Use gel to make mouths on marshmallows. Or place chocolate frosting in small resealable food-storage plastic bag, and cut off small corner of sealed bag; pipe mouths on marshmallows. You can use Betty Crocker™ Fruit Roll-Ups™ Hot Colors fruit flavored snacks to make the masks, also. Cut strips 1/2 inch wide and 4 inches long for masks. You can dry and display your pops by inserting them in a block of white plastic craft foam that can be purchased at craft stores. Try refrigerating dipped marshmallows for 20 to 30 minutes to firm up the marshmallow before decorating. 2014 Viacom International Inc. All Rights Reserved. Nickelodeon, Teenage Mutant Ninja Turtles, and all related titles, logos and characters are trademarks of Viacom International Inc.